"All art should become science and all science art; poetry and philosophy should be made one." Friedrich Schlegel’s words perfectly capture the project of the German Romantics, who believed that the aesthetic approaches of art and literature could reveal patterns and meaning in nature that couldn’t be uncovered through rationalistic philosophy and science alone. In this wide-ranging work, Robert J. Richards shows how the Romantic conception of the world influenced (and was influenced by) both the lives of the people who held it and the development of nineteenth-century science. 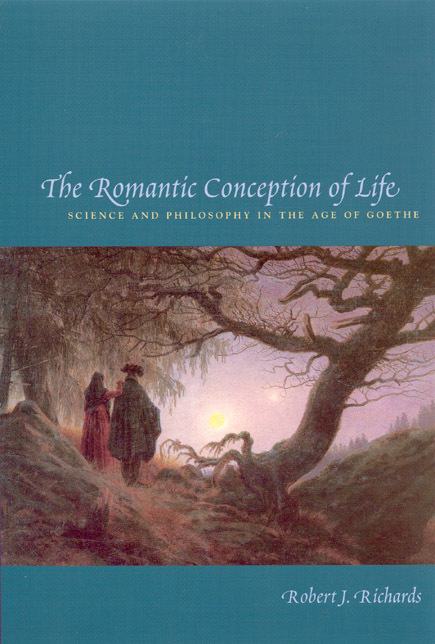 Integrating Romantic literature, science, and philosophy with an intimate knowledge of the individuals involved—from Goethe and the brothers Schlegel to Humboldt and Friedrich and Caroline Schelling—Richards demonstrates how their tempestuous lives shaped their ideas as profoundly as their intellectual and cultural heritage. He focuses especially on how Romantic concepts of the self, as well as aesthetic and moral considerations—all tempered by personal relationships—altered scientific representations of nature. Although historians have long considered Romanticism at best a minor tributary to scientific thought, Richards moves it to the center of the main currents of nineteenth-century biology, culminating in the conception of nature that underlies Darwin’s evolutionary theory.